The new Wildlife XP is our best optic for observing nature and wildlife. Ultra-high-definition optics ground from fluoride glass produce extraordinary detail and light transmission throughout the entire visible spectrum. The optical system produces an exceptionally wide field of view and true color fidelity for breathtaking views of birds and wildlife in their natural habitat. 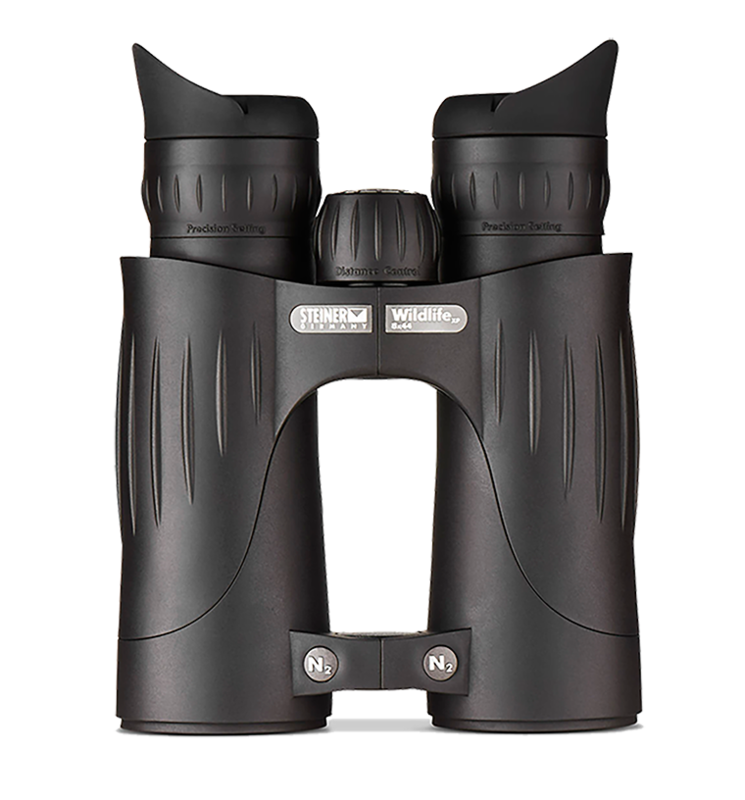 The combination of HD optics, compact, ergonomic design, wide field-of-view and low-light performance makes it ideal for naturalists and birders. fluoride glass ensures brilliant color fidelity and outstanding edge-to-edge sharpness. for the right and left eyepieces allow for individual diopter settings to suit your personal visual activity. for faster reaction times when viewing wildlife or birds. Set the Distance-Control-System for a known distance to eliminate the need for fine-tuning the focusing knob. includes textured rubber armoring and soft TechnoGel® thumb pads to reduce hand fatigue over long periods of viewing. seals 14-psi pressurized dry nitrogen into the optic, for fogproof clarity in any condition from arctic cold to desert heat. attaches and releases neck strap or harness with instant, push-button ease, and keeps binoculars hanging straight and action-ready. Wildlife XP 8x44 is rated 2.7 out of 5 by 3. Rated 4 out of 5 by Chris L from Good set of binoculars Impressive close up clarity. I like the gel pads on the thumb pads and light weight, but I like the overall package of my older Commander 7x50 better. The eye pieces are not as comfortable as my set of Commanders. On the zoom wheel, I would have thought the stop would have been the setting for infinite focus, but not the case... I had to max the individual diopters to get infinite zoom close to the stop for quick long distance focus. The strap is very nice. The case is way too big, flimsy, and not impressive. The best feature is the view up close. I wish I could have compared these to the new Commander 7x50, but couldn't find a store to have both without buying both (non returnable) pairs. Overall, I love my older Commander V 7x50, bought the Wildlife XP 8x44 for the increased FOV, and like the Wildlife XP... Just not as impressed. Rated 1 out of 5 by Stevea from Do the military really use these? I’ve had 2 pairs of these Steiner binocs and on both occasions the eye cups fell off, and I only use them once or twice a year! To be fair, they gave me a new pair at a reduced rate the first time it happened, but unfortunately it happened again. If the military really use these units I’d be surprised! The image though is fantastic, but that doesn’t help if you can’t look through them. Wouldn’t recommend as there are much cheaper products with better quality. Rated 3 out of 5 by Kris AZ from Good optic but short comings for its price I’ve had these binoculars for about a month. Took these out scouting for my upcoming deer hunt. Rainy, heavily over cast day. The low light performance is great compared to other binos I’ve used (not many in the high end category). The detail I was able to pick up on trees the shadows was great. The edge to edge clarity is not great. Was considering Vortex Razors but bought these instead. Went to a local retailer that sells Swarovski and Vortex several times. Edge to edge clarity on Swarovski SLC and EL is far better and so is the Vortex Razor. I ordered the Wildlife online without ever looking through them. The edge to edge clarity seams to get worse in bright light. This should not be an issue in this price point. The eye cups on this are garbage. They are loose and wobble, cheaper Vortex models such as Vipers have much better eye cups. These should be near perfect for the price point of the Wildlife XP 10x44. I also don’t care for the wings on the eye cups. The size and weight are larger than I expected (If I’d have read the discription I’d have known) these are larger than Vortex 10x50 (this is not a problem). The Wildlife are comfortable to hold and glassing for extended periods is easy on the eyes. I wish that there was a tripod adapter for these. I found a great sale on these otherwise I wouldn’t have purchased. For what I paid (about 1/3 of retail) I think they are a good binocular, but if you are paying a $1000 plus I would look at other binoculars. To be fair because I have not handled other Steiner Binoculars, the edge to edge clarity and the wobbly eye cups could be a fluke with the pair I have purchased. I would think quality control would have eliminated this pair if these did not meet the standard Steiner set. What kind of warranty are these protected by? The Wildlife XP binoculars are covered by the Heritage Warranty. Hello, I have seen differing numbers for the field of view. Is it 400ft@1000yds or 436ft@1000yds? Is it possible for the eye cups to be removed? If so, please tell me how to do it. They cannot be removed, but they can fold down. What is the Eye Relief specification for these (Wildlife XP 8x44)? Is the Wildlife XP the Discovery or Peregrine under another name? It is excellent, they feature our highest grade of glass. Can these be used with a tripod? They are not tripod adaptable. Do the eye cups on the 8x44 wildlife xp make it impossible to use with glasses?